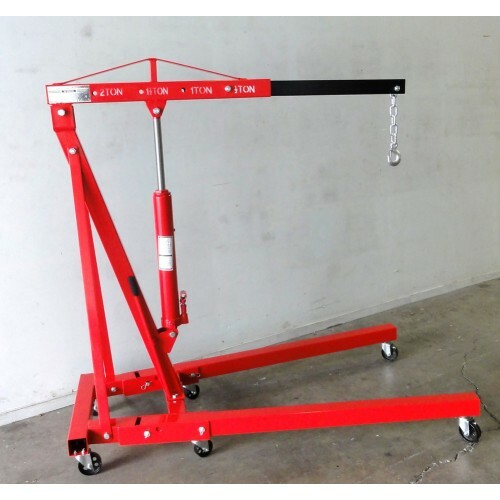 We think this is one of the best Engine Lifters / Hoists on the market in New Zealand. Note that this Auction is for the Engine Hoist only. The support legs fold back upon themselves and are secured by galvanized pins. This allows the folded machine to be safely stored away. With an 8 ton Hydraulic Ram this lifter has all the grunt that you need.The Hydraulic Ram is supplied with its own operating handle. The galvanized chain and hook with clip allow you to attach many different types of gear to your hoist . Fitted with six (6) robust Cast Steel Wheels that will not flat spot on your garage floor and allow easy movement of the rig. This is a substantial tool.... and as such it is supplied in two cartons. If picking up, please note the carton sizes and weights. When you have completed your purchase you may wish to call us to ensure that the units will fit into your vehicle. Assembly is required, and the instruction leaflet is very comprehensive.